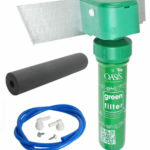 The Green Filter System by Oasis is an eco-friendly, economical, easy to use filter system that functions unlike most drinking fountain filters. What sets the Oasis filter apart from other filters? 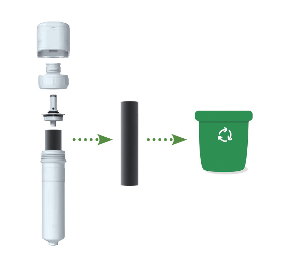 The Oasis Green Filter System features a reusable outer filter housing, so when the filter needs to be replaced, only the completely biodegradable interior filter media is disposed of. According to Oasis, over 6 million plastic filters are disposed of each year equating to over 1.1 thousand tons of non-biodegradable plastic waste. By using the Oasis Green FIlter System in your school or facility, you can save both money and energy, while decreasing plastic waste. There are two types of Green Filter® Systems: EZ-Turn, and InLine EZ-Clip. The EZ-Turn is an easy-to-install filtration system ideal for replacing pre-existing filter applications. To hook up this system, you simply push the tubes into place at the water entry and exit valves. The InLine EZ-Clip is also easy to install and is ideal in situations where space is limited, and simplicity is important. The filter body is secured to the wall or unit with the EZ-Clip bracket. Both Green Filter® Systems are compatible with most every device including water coolers, drinking fountains, bottle fillers, refrigerators, under sink filtration systems, and even coffee machines. Both Green Filter® Systems utilize a range of interior filters which utilize different medias corresponding to various performance levels. The various filter types are as follows: sediment, carbon block, carbon/phosphate, carbon/lead/silver, carbon/lead/silver/phosphate, ceramic, galaxi (carbon and synthetic fiber), galaxi/phosphate, remedi (Powdered Activated Carbon (PAC) and electro-adhesion), and remedi/phosphate. Each filter performs differently in regards to which media categories they efficiently filter. 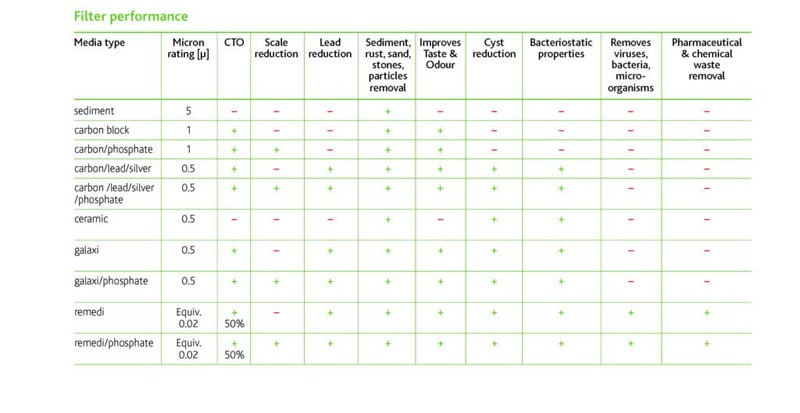 For example, the carbon/phosphate filter has a 0.5 Micron rating and proficiently filters chlorine, taste, and odor (CTO), scale reduction, and particles (including rust, sand, and stones). Review the graph below to find out how each interior filter performs for specific medias. When you choose to provide the patrons and employees of your establishment, school, or facility with clean, filtered water, you are providing them with a healthy and safe drinking water access point. When you make the decision to utilize Oasis Green Filter® Systems, you benefit yourself with cost reduction in filter replacement, reduce your carbon footprint with less plastic waste, and provide the individuals who drink your water with safe, tasty drinking water. Call one of our product specialists today to learn more about Oasis water filter systems. 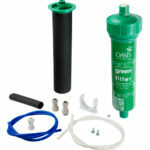 We carry the Oasis Green Filter® System as well as other Oasis water cooler filter replacement systems as well. Find out which filter system and media type is t: he best solution for your water cooler, drinking fountain, and/or bottle filler by speaking with one of our product experts: 800-442-6622 (M-F, 7:30AM-5:00PM EST). View more Oasis Filters. The filter kits shown below are listed in our online store. For specific filter medias, please call to order.